Have areas in your garden that get very little sun? 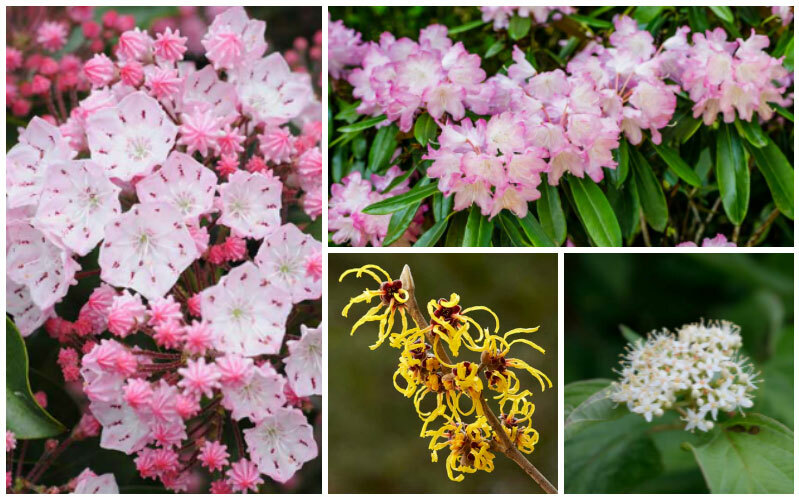 Here are some lovely and fast-growing flowering shrubs that can thrive in the shaded areas of your property. The azalea is a woody plant in the genus Rhododendron with delicate blooms that are often a shade of pink. Azalea bushes continue to grow for their entire lives and can become massive. 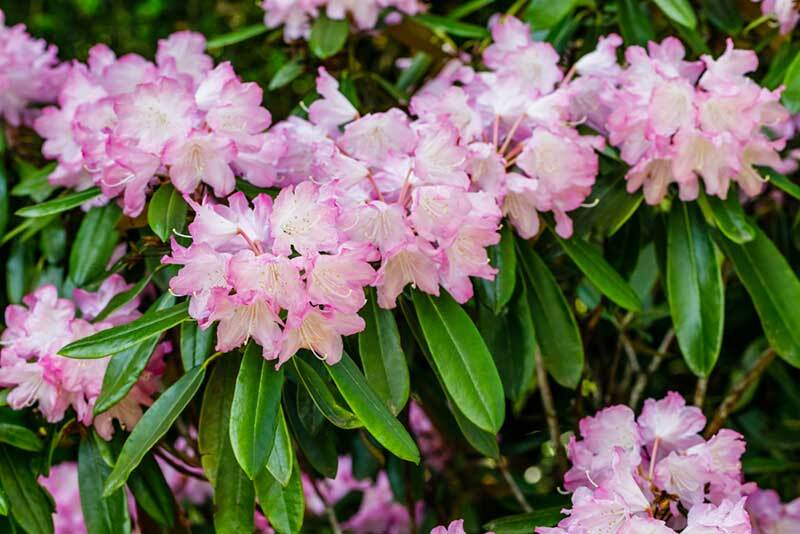 The leaves and flowers are poisonous, and azaleas are susceptible to pests like caterpillars and scale. 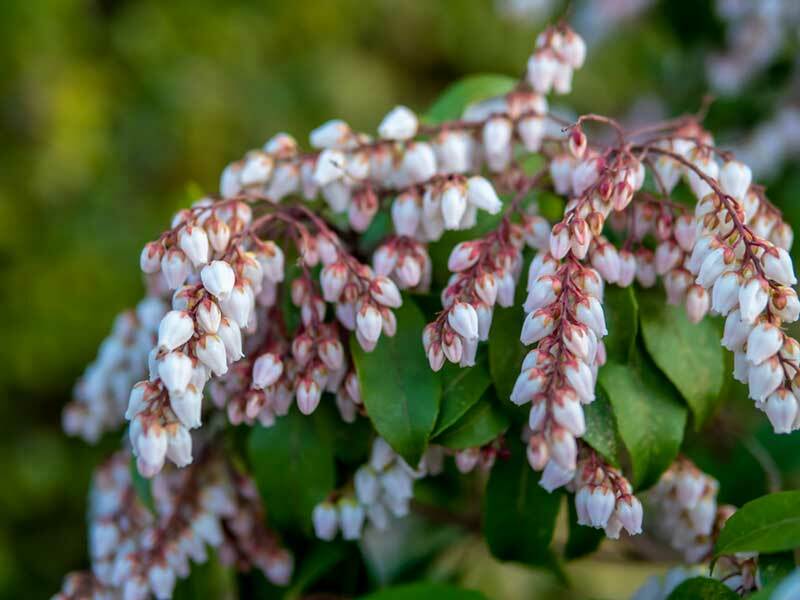 This shrub likes acidic,well-drained soil, and the bushes bloom for several weeks from the end of April through May. 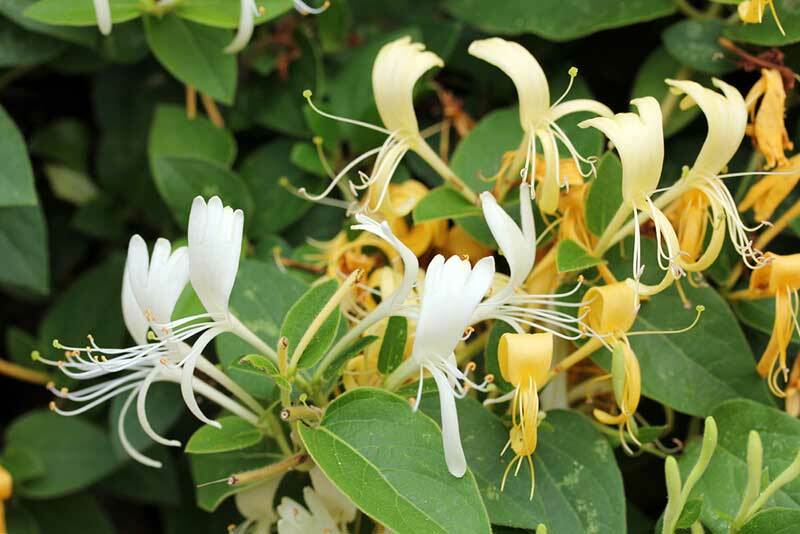 Honeysuckle is a low-growing bush that spreads out by sending out suckers that form new plants. It’s good for covering large areas and keeping soil from eroding. Honeysuckle bushes grow to about 3 x 3 feet and lose their leaves in the fall. There are clusters of yellow, red or orange tubular blossoms on the plant from June to September. This plant has evergreen leaves, brittle stems, and white, bell-shaped flower clusters. It likes moderate shade and can grow up to six or seven feet wide and eight feet tall. Originally from Japan, the Japanese Pieris blooms for about three weeks in March and April. 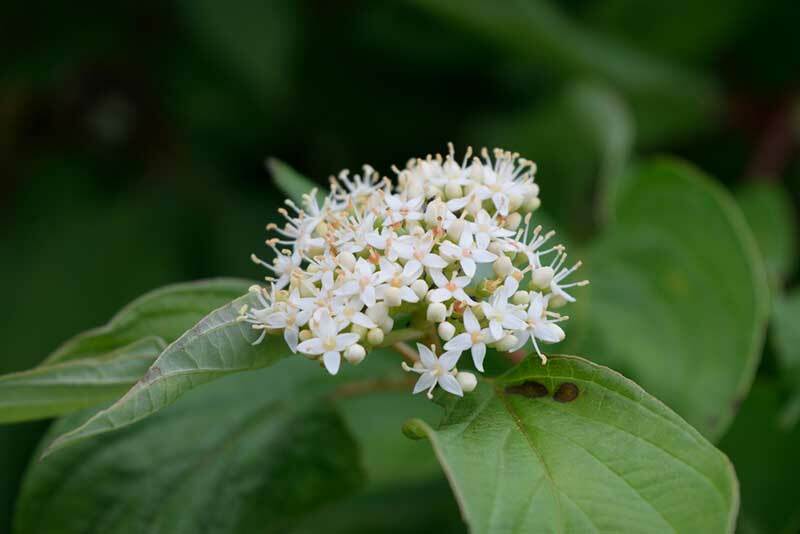 The shrub does best in partial shade with well-drained, sandy soil. The foliage turns a striking red color before becoming a dark, shiny green. The leaves and flowers are highly toxic. The broad, variegated leaves of the leucothoe are beautiful, and the plant produces little white or blue bell-shaped flowers in the spring. Growing a leucothoe bush in partial shade will increase the variegation of the slightly curled leaves. 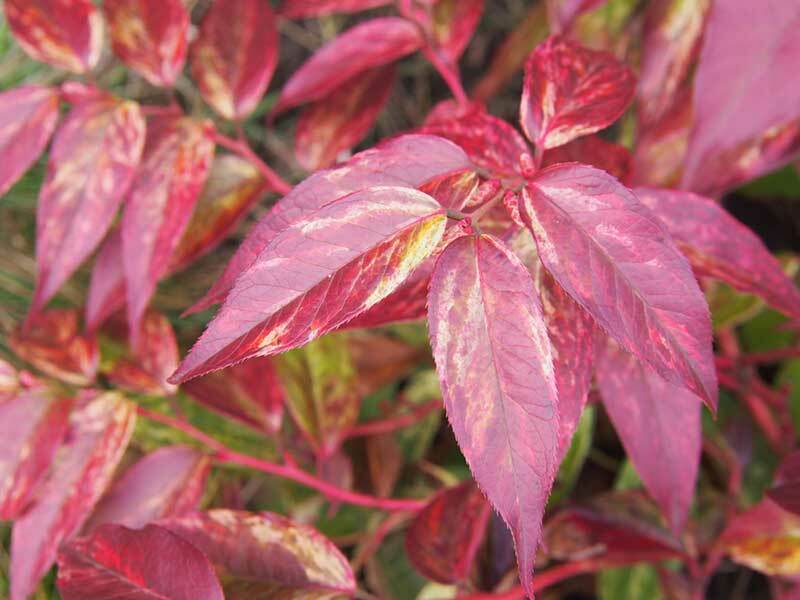 Rainbow leucothoe has striking leaves with green, bronze, pink and cream streaks. It’s an easy plant to care for since it rarely suffers from pests or disease. The plant is a transplant from Asia that does well in moderate climate zones. This flowering shrub is in the heather family, although the blooms are similar to rhododendrons and azaleas. The beautiful bowl-shaped flowers are white with dark pink markings that look like stencils. They’re highly shade tolerant and grow masses of blooms from late spring to early summer. 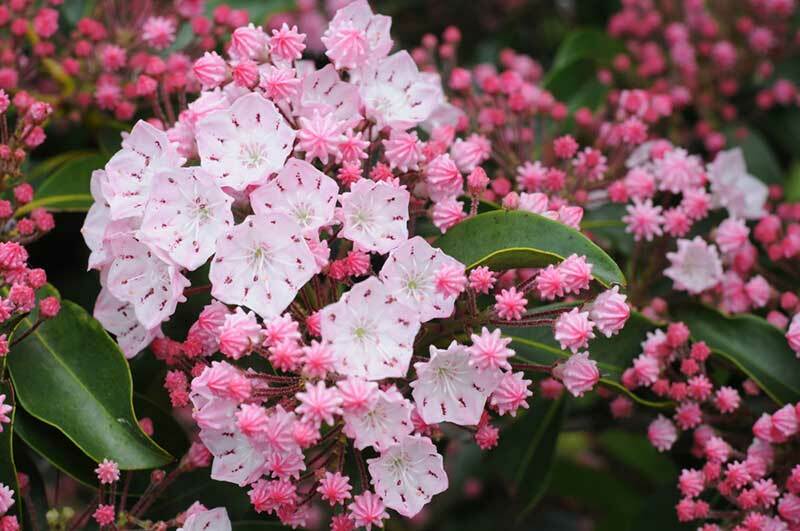 The mountain laurel thrives in moist, well-drained acidic soil. Bushes can grow from 6 to 15 feet tall and dwarf bushes grow up to four feet. The chokeberry likes moderate shade or direct sun and it can grow up to 10 feet tall and 6 feet wide. The flowers and berries will grow more abundantly in bright sunlight. In the spring, the chokeberry produces white or pink blossoms. Birds love the berries and will eat them all through the fall and winter. The red chokeberry is pest-resistant and drought-resistant, and it can grow in a wide range of soils, although it likes acidic soil best. The dogwood is a fast-growing shrub tree at two feet a year, and it can get as big as 9 x 9 feet. It has green, oval leaves and produces clusters of tiny white flowers in the spring and white berries in the fall. 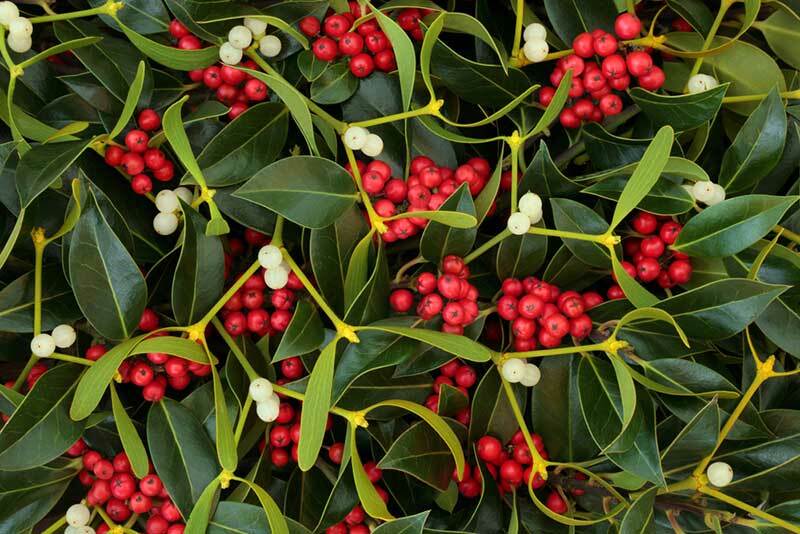 The bark of the tree is red, and the flexible stems have traditionally been used to make baskets and wreaths. The tree usually grows just four or five feet tall, and it may become a hedge through the spread of underground shoots. Many species of migratory birds and songbirds eat the berries. 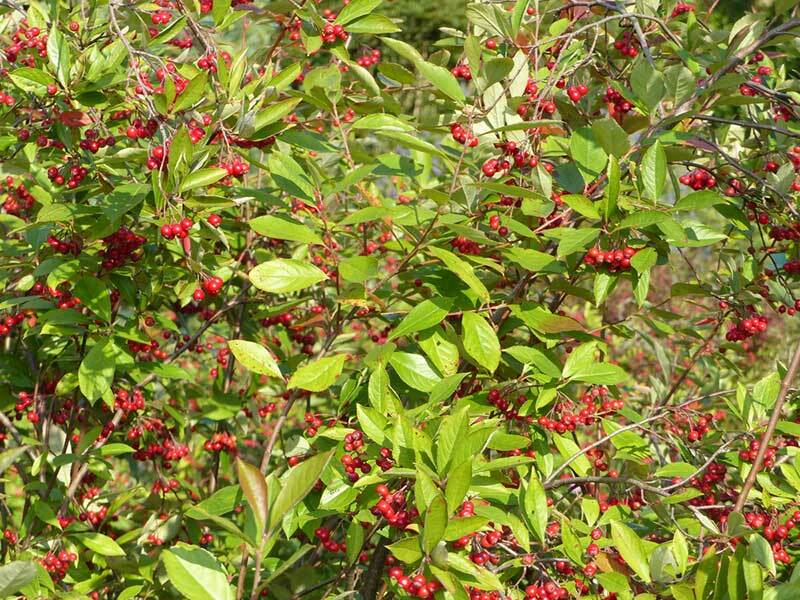 Sometimes referred to as the Christmas berry, the winterberry has showy scarlet berries in fall and early winter. The berries are a food source for wildlife but can be poisonous for humans and pets. The shrub can grow 6 to 12 feet high and almost as wide, but you can control the size by pruning it every other year in the early spring. The shrub does best in full sun, but it needs partial shade in hotter climates. 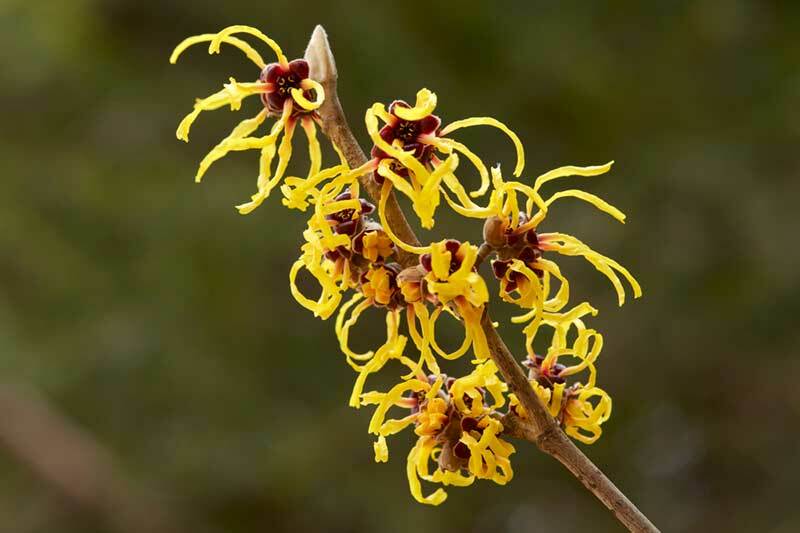 The witch hazel has long-lasting blooms in the late winter and early spring. The ribbon-shaped flower petals are often yellow but can be any color between yellow and red. The simple leaves are green and, if left untrimmed, this shrub tree can grow up to thirty feet tall. The plant does well in moist, slightly acidic soil and thrives in sun or shade. 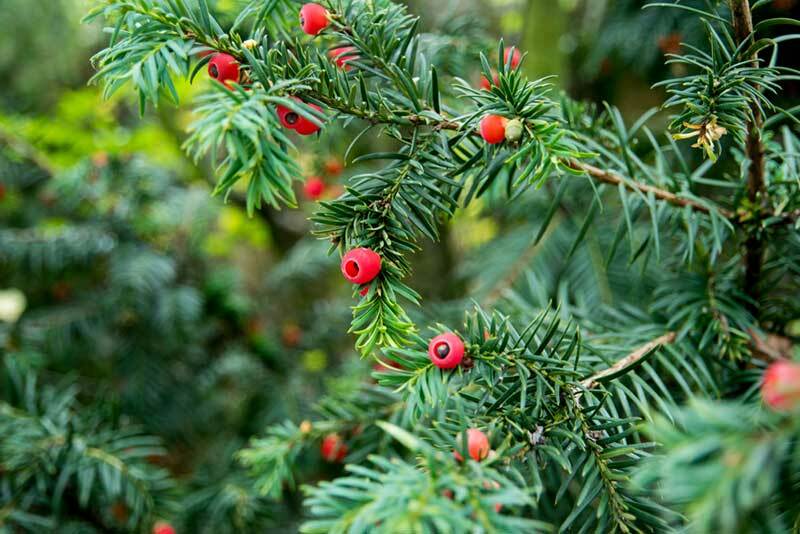 The yew is an evergreen shrub that grows well in partial shade or sun. It has flat green needle-shaped leaves and produces red berries from March to May. It makes a good hedge since the branches grow upward at the same height. All parts of the plant are poisonous if ingested by people or pets. The yew likes sandy, well-drained acidic soil, and it’s a hardy plant that requires little care.